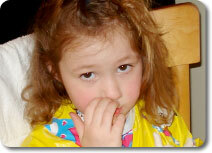 Nit Nabbers knows that a lice infestation can be more of a frustration than anything! Parents are often at their wits end, as opposed to being at their nits end, by the time they call us. But we also know that the children who are suffering from the head lice infestation can be equally frustrated, or even scared, by the treatments. Nit Nabbers is accustomed to interacting with kids of all ages, and we know how to put your child at ease. If your child is a little nervous, or just a little shy, about having his or her hair treated by a stranger, the trained Head Lice Removal professional from Nit Nabbers will know what to do! 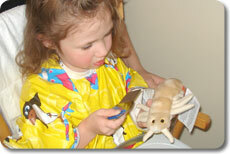 We believe that education is a key component to a child’s comfort with the lice treatment process. (Jessica* is a former teacher after all!) By showing both you and your child the Tools that we will use, we hope to make everyone more famiiar with the course of action. Children are far less likely to be afraid once they fully understand what is happening! Nit Nabbers knows that it is difficult for any child (or adult for that matter) to sit still for over two hours without some form of distraction. That is why we encourage parents to have an activity prepared for their child before their treatment begins. Choosing an appropriate activity is just one of the steps involved in Preparing for Lice Removal that we suggest you do prior to our scheduled appointment. 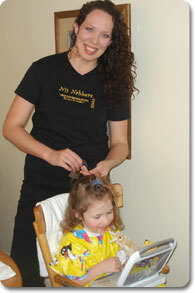 At Nit Nabbers, we find that educated, distracted children make the easiest and happiest clients! 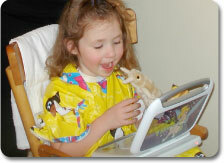 We want the kids to enjoy their In-Home Treatment as much as their parents enjoy having us there to do it for them. We truly do believe in making light of a ‘lousey’ situation. Our appointments are filled with both education and laughter as we attempt to make Lousey Puns and Nitty Fun throughout. We strive to relieve the stress and frustrations associated with a lice infestation, as well as eliminating the Lice and Nits themselves.